or Yellow Powder Coated finish. Exceeds OSHA and ANSI requirements. 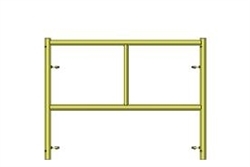 S-Style Walk-Through Scaffold Frame 3' x 6'4"
S-Style Masonry Scaffold Frame 5' x 6'4"
S-Style Walk-Through Scaffold Frame 42" x 6'4"